In addition to requiring increased surgical care and greater technical improvement, the growing complexity of surgeries targeting facial rejuvenation has deemed necessary detailed anatomic studies which permit more secure handling of several facial regions. We studied and analyzed the anatomical variations between the posterosuperior border of the platysma muscle, the external jugular vein and the greater auricular nerve. risks of lesion to the jugular vein, which may result in hematomas, and to the greater auricular nerve, which may cause anesthesia or paresthesia in an extensive portion of the face,(8,12,17) have been frequently cited. 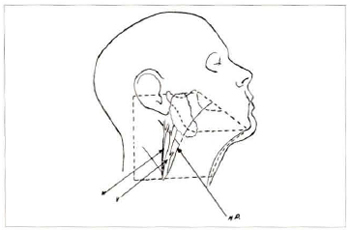 The studied area is located between the inferior border of the mandible and an imaginary line which crosses the neck horizontally, at the thyroid cartilage (Fig. 1). Fig. 1. Schematic drawing of the studied area. The traced line shows the dissected area, being inferior to the imaginary line height at the thyroid cartilage level. (+ +) - Inferior mandible border; (N) - Great auricular nerve; (V) - External jugular vein; (MP) - Posterosuperior platysma border. Several studies about the facial anatomy have been published, however none has detailed this region. CARDOSO DE CASTRO(l) studied the platysma extensively, focusing his investigation on the variation in the distribution of medial fibers. DIGNAM AND GRABB(2) published a c1assical study on the anatomy of the facial nerve's mandibular branch. Their study showed that the facial nerve's mandibular branch is located 2 cm below the mandibular angle. After crossing the facial vein and artery, its trajectory runs above the border of the mandible. In contrast to DIGMAN, BAKER AND CONLEY(3) assert that the mandibular branch is located up to 6 cm below the border of the mandible. VISTOES AND SOUTHER(5) published an interesting study about the anatomy of the platysma, making a detailed analysis of the medial fibers. MCKINNEY AND KATRAMA(6) did an anatomical study targeting the prevention of lesion in the greater auricular nerve and concluded that this nerve is always simated at an average distance of 6.5 cm from the external acoustic meatus. At the beginning of its cervical trajectory, the external jugular vein crosses the sternocleidomastoid muscle perpendicularly and superficially at a point directly below the lower half of the platysma muscle. The superior segment shows variations of the platysma muscle. It is formed where the retromandibular vein and the posterior auricular vein mect, at a point below and behind the mandibular angle. This junction occasionally occurs in the lower portion of the parotid gland. It continues down towards the middle of the clavicle, of the cervical fascia - approximately 2 cm above the clavicle - and ends in the subclavian vein. The greater auricular nerve can be found in the triangle behind the lateral border of the sternocleidomastoid muscle, which is located right below the least occipital nerve. It surrounds the sternocleidomastoid muscle and crosses it diagonally towards the ear and the mandibular angle. It splits up into 3 branches over the sternocleidomastoid muscle: mastoid branch, auricular branch and facial branch. They innervate the skin of the mastoid process, the inferior portion of the ear on both sides, the skin over the parotid gland and the mandibular angle. Ten non-formalized cadavers, nine male and one female, were dissected for this study within a maximum of 12 hours post-mortem. Ages ranged between 21 and 27 years. An area whose lower limit consisted of an imaginary line at the thyroid cartilage was located in the cervical region of all cadavers. 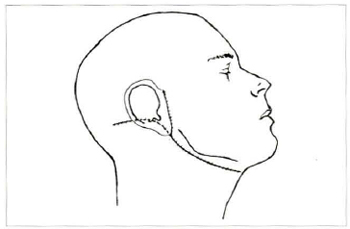 The region's upper limit was the zygomatic arc; the rhenogenous sulcus and the medial anterior line preceded it, perpendicularly at the neck; the mastoid process succeeded it (Fig. 1). A pre and retroauricular incision simulating the one utilized for dislocation in plastic surgery of facial wrinkles provided access to the area, exposing a larger portion of the lateral part of the neck. The incision started at the ear lobe and continued diagonally towards the neck, at a point right below the border of mandible. It ended in the medial perpendicular anterior line to the neck, at the thyroid cartilage. A horizontal incision of 5 cm in the mastoid region was added for better visualization of the study area (Fig. 2). 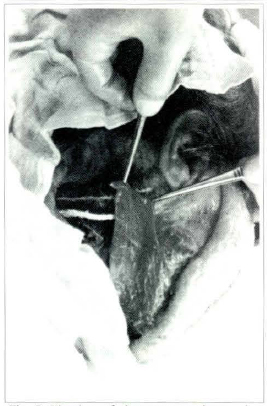 The origin of the incision was the upper extremity of the retroauricular incision. Fig. 2. The crossed lines precise the incisions perfomed on the specimens. The distances between the srudied structures and the fixed anatomic points such as the posterior border of the sternocleidomastoid muscle, the stylomastoid foramen and thyroid cartilage have not been considered in this study due to great variation regarding the cadaver's longelineal or brevilineal biotype. We focused our study on the distance relationships between the greater auricular nerve, the external jugular vein and the posterior border of the platysma muscle due to their practical importance to plastic surgery of the face. Dissections were always unilateral. They were initially performed at the subcutaneous plane, followed by lipectomies for better visualization of vascular, muscular and nervous structures (Fig. 3). Thickness of the platysma muscle in this region varied from a thin layer whose limits could be hardly defined to a thick, easily identifiable and easily dissectible muscle (Fig. 4). These variations in thickness seemed to be essentially personal characteristics and were not related to age, physical biotype or color of skin. Fig. 4. In some dissections the platysma muscle was thick and of easy dissection. CARDOSO DE CASTRO's(1) findings about the arrangement of the platysma muscle's posterior fibers were confirmed: fibers are always situated behind the gonion. However, we observed variarion in the inclination of the fibers. They tended to be more horizontal in brevilineal biotypes, exposing a larger portion of the greater auricular nerve and of the external jugular vein. The external jugular vein was analyzed in relation to the posterosuperior border of the platysma muscle and its distance to the greater auricular nerve. In the first case, the vein was covered by the platysma muscle; in 4 instances it bordered the posterosuperior fibers of the muscle; and in the remaining 5 cadavers, the vein was behind the platysma muscle at a maximum distance of 3 cm and at an average distance of 1 cm (Fig. 5A, B, C). Fig. 5. Drawing of the position variations of the external jugular vein and platysma muscle. (MP) - Posterosuperior border of the platysma muscle; (V) - External jugular vein; (A) - External jugular vein covered by platysma fibers (1 in 10 cases); (B) - Vein fringing the muscle border (4 in 10 cases); (C) - Vein posterior to the muscle (5 in 10 cases). 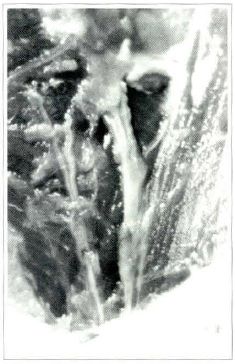 In all cases the platysma muscle started to cover the jugular vein at a distance of 8 to 9.5 cm away from the tragus (Fig 6). The diameter of the vein varied. However, there was no relation between vein caliber and positioning. Fig. 6. 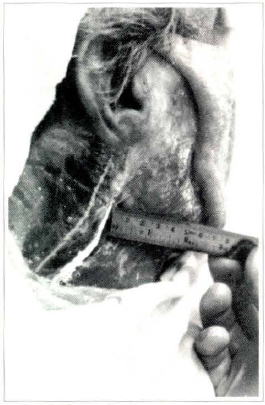 In all dissections the distance of the tragus was determined by the height in which the external jugular vein traveled behind the platysma fibers. This measure showed that the vein was already covered by the muscle at 8-9,5 cm. Fig. 7. (A) - Position of the great auricular nerve - always posterior to the external jugular vein; (B) - When tractioned the platysma muscle will cover both the great auricular nerve and the external jugular vein. The greater auricular nerve has a similar trajectory to that of the external jugular vein in this region. The grearer auricular nerve is always positioned behind the vein at a maximum distance of 2 cm and at an average distance of 1.5 cm. In all cases the greater auricular nerve was located behind the fibers of the platysma muscle. Our of the three structures studied, the one that seemed to be the easiest to examine was the external jugular vein. The external jugular vein could also be the best reference point during a surgical procedure. This fact becomes even more important since during an external examination the trajectory of the jugular vein can be observed and serve as a parameter during a cutaneous dislocation. The posterior limits of the platysma muscle are hard to define in some cases when its fibers are thin and slender. Since its position varies regarding the external jugular vein, which is much easier to identify, it is advisable that during the lateral dissection of the muscle the incision is started at a position anterior to the jugular vein and then the dislocation of the platysma muscle is initiated. It is harder to identify the greater auricular nerve due to its color, its smaller thickness regarding the jugular vein, and because it is covered by subcutaneous cellular tissue. However, its trajectory always posterior (thus exposed) to the lower border of the platysma muscle and to the external jugular vein seemed to be the most constant of all. In this way, the dissections of the platysma muscle do not present risks of injury to the greater auricular nerve. 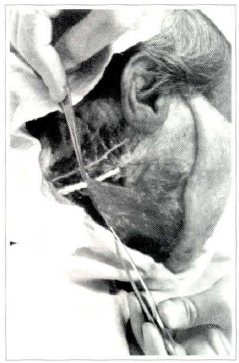 However, special attention should be payed when rotation or advancement of platysma fibers towards the mastoid is performed, because the fixation sutures may encompass and injure the greater auricular nerve (Fig. 8). Fig. 8. Fixation of platysma muscle may incorporate the great auricular nerve. Knowledge of the relation and distance between the external jugular vein, the greater auricular nerve and the posterior borders of the platysma muscle shall prevent nervous lesion. Since the nerve is always located behind the external jugular vein at an average distance of 1.5 cm and at a maximum distance of 2 cm, it is the most easily identifiable anatomic structure in this region. 1. CARDOSO, DE CASTRO C. - The Anatomy of the Plasma Muscle. Plast. Reconstr. Surg. 66:680, 1980. 2. DINGMAN R. 0.; GRABB, W. C. - Surgical Anatomy of the Mandibular Ramus of the Facial Nerve Based on the Dissection of 100 Facial Halves. Plast. Reconstr. Surg., 29:266, 1962. 3. BAKER, D. C.; CONLEY, J. - Avoinding Facial Nerve Injuries in Rhytidectomy. Plast. Reconstr. Surg., 64:781, 1979. 4. DE CASTRO, CORREIA P; ZANI R. - Surgical Anatomy of the Facial Nerve, as Related to Ancillary Operations in Rhytidoplasty. Plast. Reconstr. Surg., 52:549, 1973. 5. VISTNES, L. M.; SOUTHER, S. G. - The Anatomic Basis for Common Cosmetic Anterior Neek Deformities. Ann. Plast. Surg., 2:381, 1979. 6. McKINNEY, P; KATRANO, D. - Prevention of Injury to the Great Auricular Nerve During Rhytidectomy Plast. Reconstr. Surg.,66:675, 1980. 8. FRANCO, T.; REBELLO, C. - Ritidoplastias. 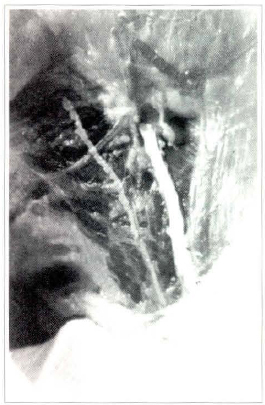 Cirurgia Estética, Livraria Atheneu, Rio de Janeiro, S. Paulo, 1977. P 49. 12. SMITH, T. W. - The Aesthetic Anatomy of the Facial Nerve. In F. W. Masters and J. R. Demis (Eds). Symposium on Aesthetic Surgery of the Face, eylid, and Breast. St. Louis Mosby, 1972. P 37. 13. GARDNER, E.; GRAY, D. J.; O' RAHILLEY, R. - Anatomia. Guanabara Koogan, Rio de Janeiro, 1967, Translation ofthe 2nd edition. P722. 14. LOCKART, R. D.; HAMILTON, FYFE, F. W. - Anatomy of the Human Body, 2nd Ed London: Faber and Faber, 1965. P155. 15. TESTUT, L - Trité D' Anatomie Humaine, Vol 1, 5th Ed Paris: Octone Doin, 1904, P737. 16. WOODBUME, R. T. - Essentials of Human Anatomy, 2nd Ed. New Yorh: Oxford University Press; 1961, P156. 17. REES, T. D. - In Aesthetic Plastic Surgery, WB Saunders Company Philadelphia, 1980. P.634. I - Professor of the College of Medicine and Medical Sciences of Universidade do Estado do Rio de Janeiro. Member of the Brazilian Society of Plastic Surgery and of the Brazilian College of Surgeons. II - Professor in charge of the Plastic Surgery Sector of the College of Medical Sciences at UERJ.